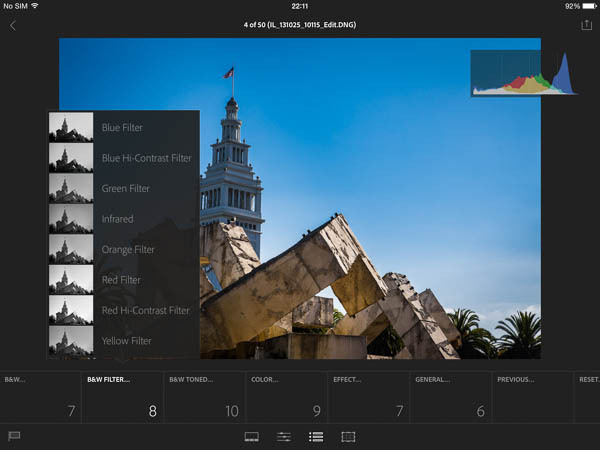 Above are the aspects of Lightroom mobile that Adobe and many reviewers will likely highlight, and to be fair, they’re generally deserved of praise. 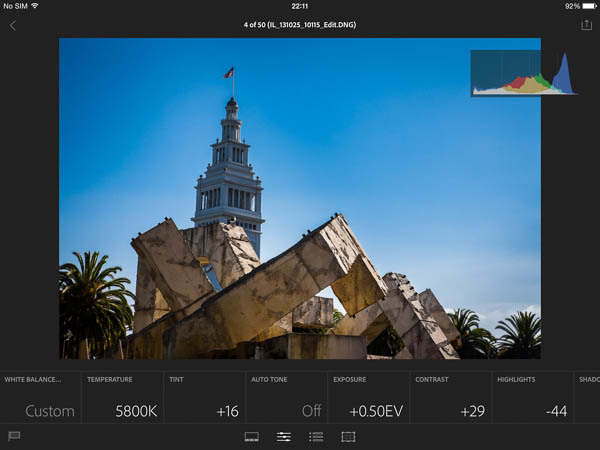 However, there are currently some very significant limitations to Lightroom mobile, which might cause some users to take a less positive view than Adobe would wish for. For example, this initial version doesn’t support rating or labels. Nor does it support any form of metadata editing (i.e. basic metadata can be displayed but not applied or edited). I expect these shortcomings will be addressed in future versions, but for now their absence does limit the usefulness of Lr mobile. To use Lr mobile it’s necessary to sign up to one of the various Creative Cloud (CC) options. Without CC Lr mobile is little more than a desktop ornament. While the cost of the Photoshop Photography program at $10 per month is actually pretty good value many potential customers will likely reject Lr mobile simply because they’re unwilling to enter into any form of software subscription plan. Sync speed between the desktop and iPad is heavily dependent on your internet connection (i.e. there is no peer-to-peer option). So, users with a slower internet connections will find that the sync takes a lot longer than may be prepared to wait. For example, the best I can achieve with about 350kbs upload bandwidth is to sync a collection of 200 images in approximately 1 hour 50 minutes. Users with much faster connections are reporting a similar number of images being synced in 10 to 15 minutes. 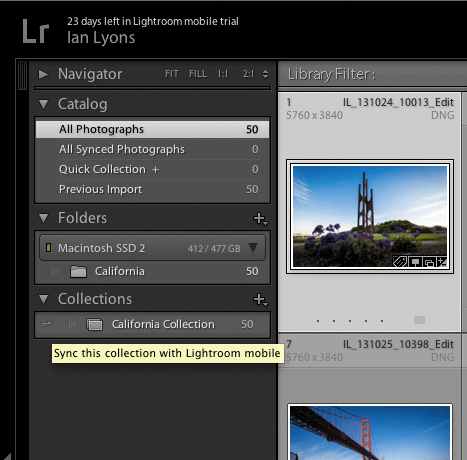 Lr mobile can only sync with one Lightroom desktop catalog. If you try to sync with a second desktop catalog Lr mobile will warn that the previous synced catalog and images will be removed from the iPad and Creative Cloud. I have laboured the last point because I’ve made the mistake myself on at least two occassions and ended up getting no work done. It was not a pleasant experience the first time, and even less so the second. So, be warned. 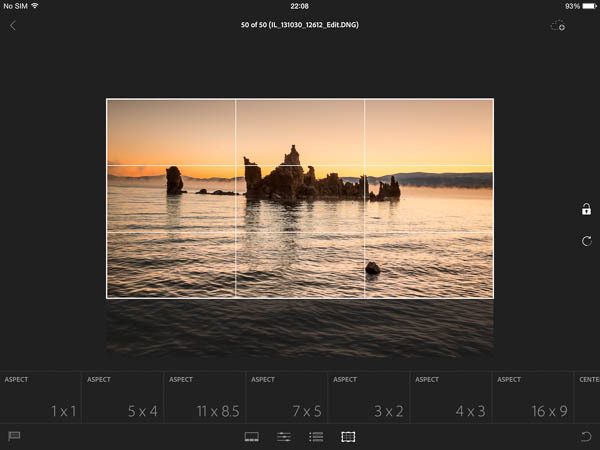 Lightroom mobile is a companion to Lightroom desktop, and is the first version of Lightroom desktop that includes the ability to sync images to Lightroom mobile. You can update to the latest version of Lightroom 5 using either the Creative Cloud app on your desktop computer or by clicking on the Lightroom “Help-> Check for Updates” menu option. 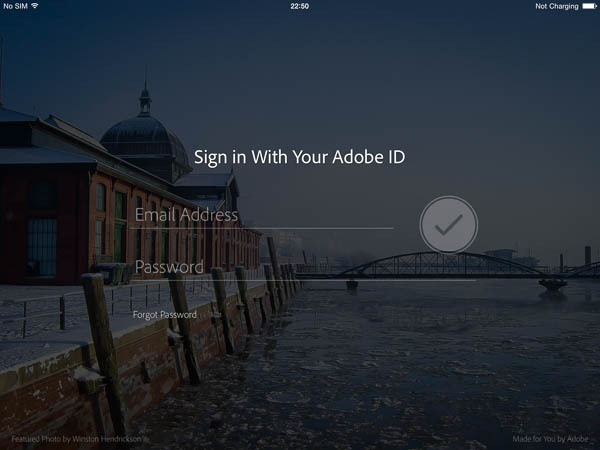 To sign in you must open the new panel hiding within the Lightroom identity plate. This panel also serves as an indication of sync progress. Lightroom mobile is organised around Collections. 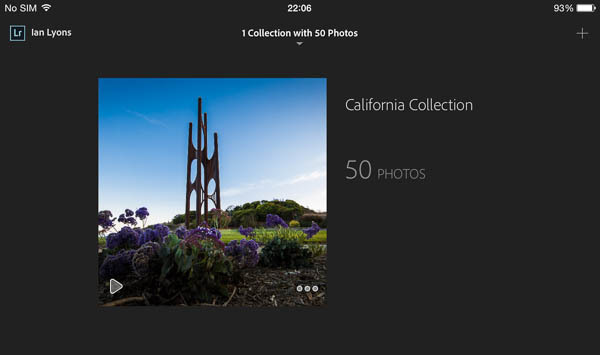 Images within Collections will be synced to your iPad and be available in Lightroom mobile for editing. 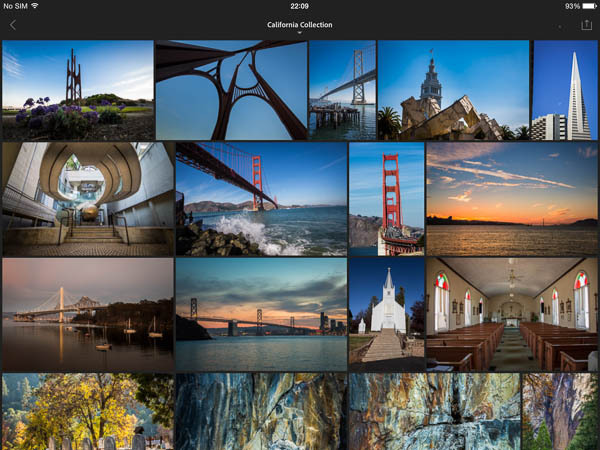 Visit the Apple App Store using your iPad and download Lightroom mobile. Once you login with the same Creative Cloud account as your desktop computer, you’ll see all of your synced Collections. In above example, I have synced 50 images from a collection held on my desktop computer. Using the normal iPad gestures (i.e single tap on collection image) I was able to open into a view that shows all of the images making up the collection (Grid view). 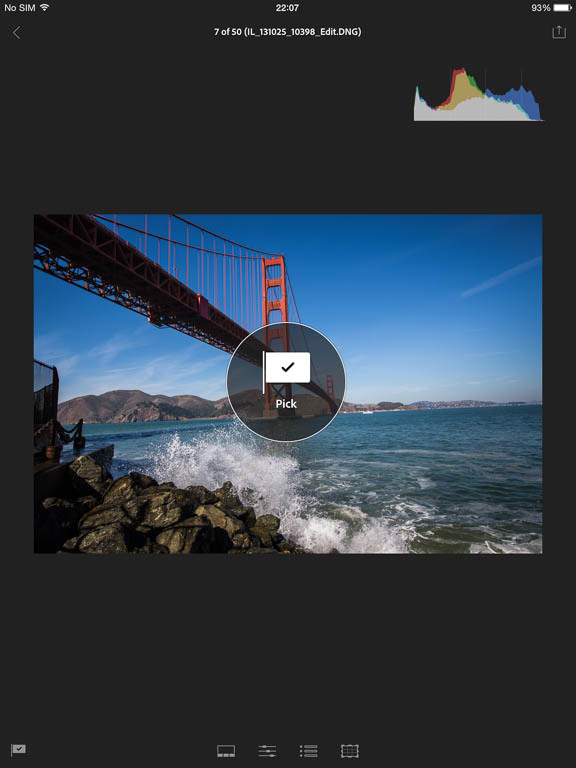 A single tap on any image within the Grid view will open that image into Loupe view. In Loupe view it’s possible to Pick and Reject individual images (sweep finger up is used for Pick and Down for Reject). In above example, you’ll note the histogram on top right and a row of four buttons along the bottom. 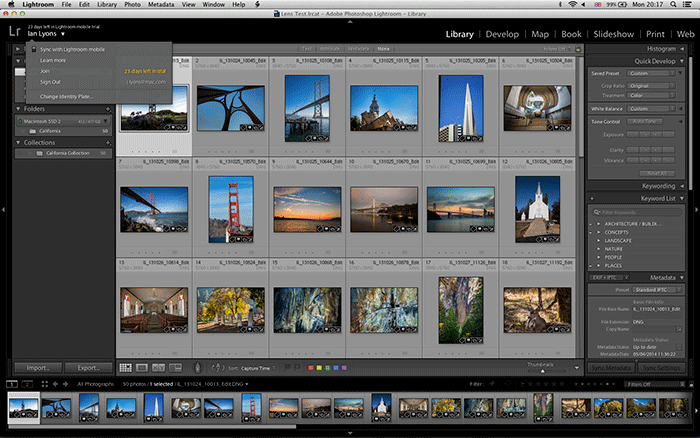 The buttons from left to right are: Filmstrip, Develop adjustments, Develop Presets, and Crop. I’ve included a screenshot for the Develop adjustments, presets and crop below. In addition to the features outlined above it’s also possible to import images directly from the iPad Camera Roll. Unfortunately, due to iOS limitations raw is not currently supported. On a more positive note, it’s possible to present your images as a slideshow. Lightroom mobile also includes support for sharing your work using social media such as Facebook and Twitter. This entry was posted in Adobe, Adobe Creative Cloud, Adobe Photoshop Lightroom, Creative Cloud, iPad, iPhone, Lightroom mobile. Bookmark the permalink.